Humewood Golf Course in Port Elizabeth is one of South Africa’s top-rated golf clubs and arguably the finest links course in southern Africa. Humewood, a true Links course, has hosted numerous PGA events, including the South African Open. The course is surrounded by coastal bush and, although it is close to the centre of Port Elizabeth, one sees very little evidence of human encroachment. 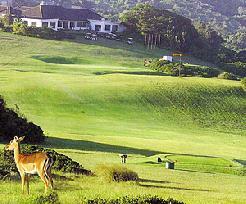 Humewood Links is characterised by thick coastal bush, swales, humps and hollows. Forming part of the coastal City of Port Elizabeth, Humewood is undoubtedly the favourite links course in South Africa and loved by the professionals. Situated on the sand dunes on the shores of Algoa Bay, Port Elizabeth, the fairways are exposed, undulating and wide to compensate for strong winds. Bunkers are few with steep faces, greens are firm and fast, the rough is thick coastal bush and there are no water hazards. The course centres around the old, white walled, double storey Club House. Elegantly set, it extends a warm and welcome feeling to visitors. Indulge in some superb views over the course and Algoa Bay from the "19th". Abundant animal life is found including monkeys, small buck, tortoises, meerkats and plovers. The crowned plover or "kiewietjie" is found on the club's emblem. The great Bobby Locke considered Humewood to be the best course in South Africa rating it alongside the top links courses in Britain. He said that Humewood Golf Club was good enough to host The British Open should this Championship ever have to be played outside of Britain. Signature Hole: is the long par four 13th (featured - main pic.) A straight long drive up the left hand side of the fairway - leaves you with a long iron (or wood) into a small elevated green, tucked around a hump to the right of the fairway, and surrounded by bush. - It is a beauty! Visitors are invited to enjoy a round on this championship links course and whilst you're soaking up an almost old-fashioned atmosphere, watch out for that wind! 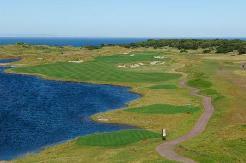 Benign on a calm day - the prevailing south-easterly and westerly winds will demand all your golfing skills.